Ready to Ship Sign Supply Company Features 100s of In Stock Items! 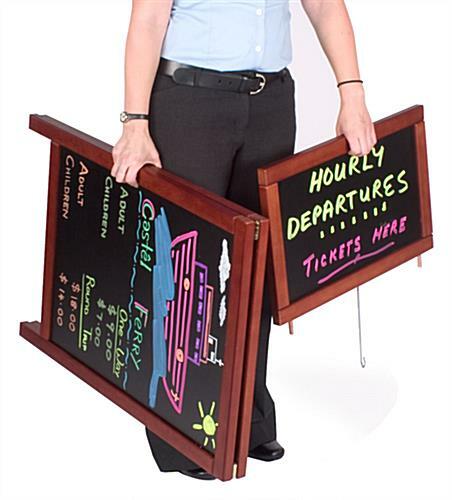 This Sign Supply is a Stylish Alternative to Metal Sign Making Stands! 18-3/4"w x 11"h removable header for displaying additional headlines or company name. Double-sided to maximize graphic exposure. 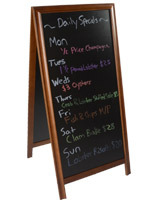 18-3/4"w x 26-3/4"h wet-erase blackboard for daily message changes. Quality wood frame with mahogany finish for matching outdoor environments. 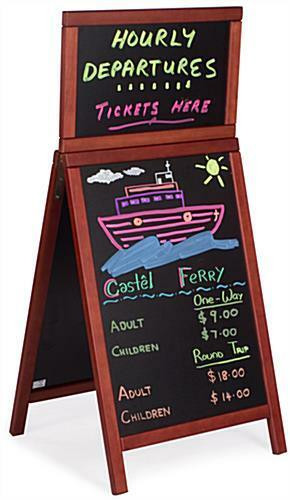 The wet erase surface on this sign supply allows you to change messages as often as you want. This sign supply allows for the use of a variety of writing instruments including standard chalk, neon wet-erase pens or liquid chalk markers. 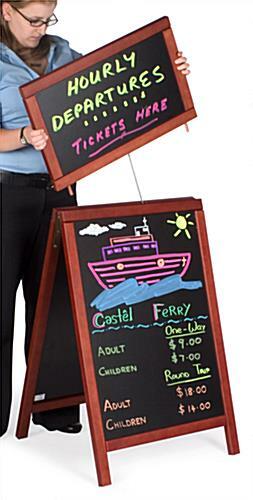 However, to give your message the most impact, we recommend using neon wet-erase markers or liquid chalk markers. 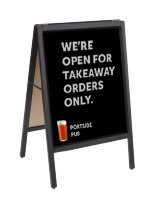 This quality sign supply, sandwich board or sidewalk sign, is shipped with a removable header that can be used to present your company name, logo, welcome message, or any other message of your choice. 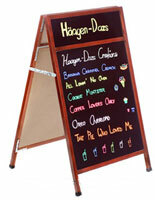 This easel-style sign supply is an ideal advertising aid for restaurants, retailers, schools, pubs and nightclubs. This menu sign, easel-style sign supply, is constructed of high-quality wood with a mahogany finish that gives it an upscale look, making it perfect for professional offices and high-end retail and food establishments. This sign supply, also called a sidewalk display, is an attractive advertising aid that every business can use to promote sales. 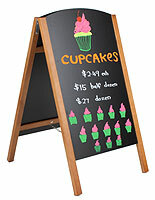 The sign supply's wet-erase blackboard surface is easy to use. 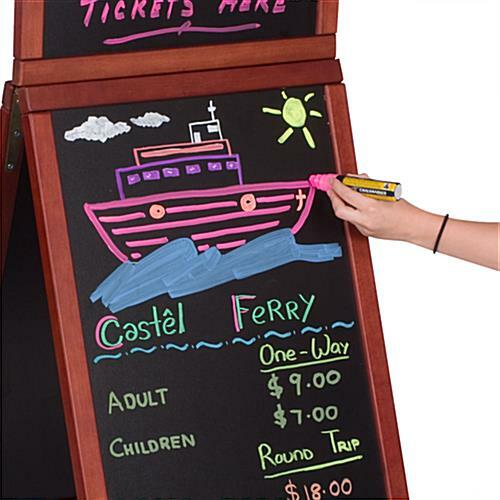 Just write your message on the board and use a damp cloth to remove it. Use this affordable sign supply for sale to advertise special events, sales, menu specials, service promotions, and much, much more! 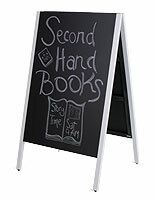 This sign supply, wet-erase chalkboard or a-frame sign, is double-sided to ensure maximum exposure! 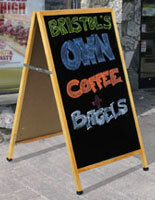 Buy sign supplies online today and get your message out to everyone that walks by your business! 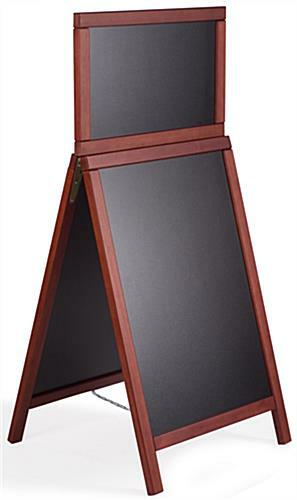 Why choose these Deluxe a-frames? 9.3" x 47.3" x 20.5"